What Happens When a Train Derails? A derailment occurs when a train runs off its rails; however, this does not necessarily mean it completely leaves its track. The majority of derailments are minor, but all result in operations being disrupted until the issue can be resolved. Regardless of how minor the actual derailment is, individuals on the train or vehicles near tracks face potential health and safety hazards. When a train derails, its passengers and crew face the risk of serious physical injury. If the train is hauling hazardous materials, the surrounding environment and population may be at risk if the hazardous substance is released. While most derailments result from operational errors or mechanical failure, there have been instances where trains are deliberately derailed to avoid or prevent a more serious accident. 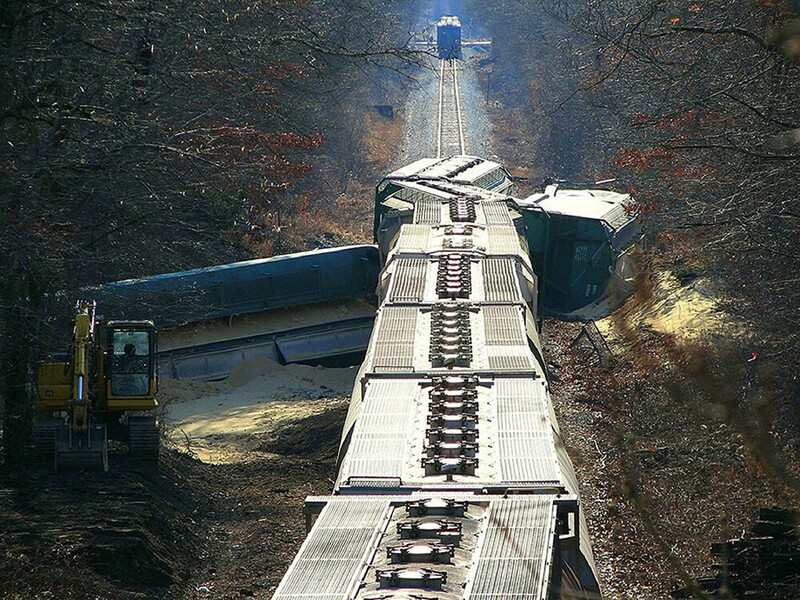 Train derailment causes can be boiled down into two broad categories: operational errors (i.e. human errors) and maintenance neglect. Because of the nature of these categories, the accidents that take place are almost always preventable. Let’s take a closer look at these two categories. Operational Errors. Operational errors, or human errors, occur when the train engineer or the crew are negligent. With respect to the engineer, negligence is often exhibited by being distracted by a cell phone, using drugs or alcohol while operating the train, or speeding. Speeding is a leading cause of all train accidents. The train’s crew may be deemed negligent if they improperly switch tracks, ignore safety precautions regarding pushing train cars, or leave train cars in unsafe positions for other cars nearby. Maintenance Errors. Maintenance errors can be related to the track or the train, itself. Track defects are the second leading cause of train accidents. Broken or stretched rails, welds or improper maintenance of the ballast in areas prone to derailment like bridges are likely to cause derailments because they throw off the alignment, gauge, and elevation of the train. If the train is not properly and regularly maintained for possible defects, this can also lead to devastating train wrecks. While less common, signal and communication errors and extreme weather conditions can also contribute to train derailments. What Can Be Done to Prevent Trail Derailments in Illinois? There are a variety of government and state programs designed to prevent train accidents. Most of these initiatives focus on improving the mechanical issues trains face, as well as educating the general public about train safety. The Federal Railroad Administration (FRA) is an agency of the United States Department of Transportation. Among other things, the purpose of the FRA is to promulgate and enforce rail safety regulations, administer railroad assistance programs, conduct research and development to support improved railroad safety and national transportation policy. The FRA oversees both passenger and freight rail operations in the United States. All passenger and freight travel in the United States on the national interconnected rail infrastructure is subject to regulation by the FRA. The FRA enforces safety regulations, including speed limits and other safety features like positive train control. (A system that is designed to automatically slow down trains at risk of derailing because of speed issues). Investigating all train accidents that occur in Illinois. Unfortunately, because of human error, these regulations have not prevented all train derailments. If you find yourself the victim of a train accident, you’ll benefit from seeking experienced legal representation. Our Chicago attorneys can help you ease that burden and hold the negligent party accountable for the accident. Contact us today for more information.